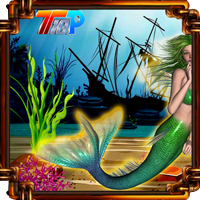 Top10 Rescue the Mermaid 1 Escape is another point & click escape game developed by Top10NewGames. In this game, you came to know that someone trapped a mermaid and locked her up in a cage. You need to rescue the mermaid from there by finding useful objects, hints and by solving puzzles. Click on the objects to interact with and solve puzzles. Good luck and have fun! 56 = (5 + 1) (5 * 6) = 630 ... and so on. You're given two numbers that are to be calculated out to make a three digit number. For the first number, use the second number. For the last two, multiply the two. So, for the 56 to become a three digit number, keep the second number (6) then multiply the five times six to get 30. The three digits become 630.